I love reviewing lotions, especially eco-friendly made lotions made for sensitive skin. As a green blogger with sensitive skin I know what I like or don't like in a lotion. 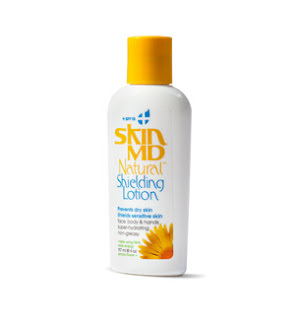 So, when the opportunity to try Skin MD Natural Shielding Lotion, SPF 15 came my way I took it. My review: I reviewed, a 4 oz bottle of SPF15 Skin MD Natural Shielding Lotion. 4 ounces of lotion doesn't sound like a lot of lotion to sample, but a little bit of this lotion goes a long way. I also found the size and shape of the bottle to be the perfect size to store and find in my purse. Greasy? When I sit down to type up a review I often have the product I'm reviewing near me to taste, touch, see, listen or feel again. It helps reminds me (my notes do too) why or why I didn't like a product. One thing I often notice about lotions is their greasiness. If they are greasy the greasiness often smears onto the keyboard buttons and my fingers slip a little or they feel so greasy I have to rub the lotion off onto a napkin to make it comfortable to type again. I didn't have this problem with Skin MD. Skin MD has a thin (not too thin) layer of moisturizing lotion that absorbs into my skin right away leaving behind a lustrous look and smooth feel on my skin. I had no skin irritation from it and the soft scent is very pleasing. I also had no need for reapplications during the day. How affective is the SPF 15 in preventing sunburns? To be honest, with temperatures soaring in the 3 digits here... I stay indoors as much as possible. So, I have no idea if the sun protection works or not. However, I am impressed that the facility where the lotion is made is 100% solar powered. "Our lotions are made to be free of parabens, petrochemicals, dyes, and other irritating ingredients. They are also vegan, cruelty free, and ego-friendly. We don't participate in animal testing or use any animal products in our lotions and Skin MD Natural is formulated in the United States in a facility that uses 100% solar power" (http://www.skinmdnatural.com/). I could do without the small print at the back of the bottle. It was difficult for me to read "other ingredients". It is important to me to be able to read the ingredients so I know what I'm actually putting on my skin. What I do like is Skin MD's break down of ingredients on their website here. Still, I'd like Skin MD to make the font larger or clearer to print on the bottle. What kind of score does Skin Deep give this lotion? According to the EWG's Skin Deeps Cosmetic Database this lotion scored a 5 (a moderate score) in the ratings in November 1999. This was the most updated rating I could find and may or may no longer be accurate. The Giveaway: Open to U.S. and Canada. One lucky winner will get 4 oz. full-sized bottle of Skin MD Natural Shielding Lotion. *Deadline: June 30th, 2011. Mandatory Entry: Visit Skin MD. Then leave a comment below, tell me what you learned about natural skin care. Disclaimer: Skin MD provided me with a free sample of this product to review. I was under no obligation to review it if I chose. Nor was I under any obligation to write a positive review or sponsor a product giveaway in return for the free product. I like that Skin MD Natural mimics the skins own moisturizing properties. Signed up for the Skin MD Naturals newsletter. I now follow Skin MD on Twitter. I now like Skin MD Naturals on Facebook. A shielding lotion protects the outer layer of skin, preventing an array of toxins from entering through the skin's surface. I subscribed to receive the Skin MD Natural Skin Care Newsletter using dod@rogers.com. I am following Skin MD on Twitter. I am a fan of Skin MD on Facebook. Subscribed to their newslett using the email"news at telus dot net"
I learned that Skin MD Natural lotion uses only the finest high quality ingredients to create a lightweight formula that absorbs quickly for silky, smooth skin without any greasy residue. I follow Skin MD on twitter! t999n999t99! I like Skin MD on facebook ! Thuy T.
I learned that a shielding lotion protects your skin, allowing your own natural moisture to heal the skin,"
I learned that it is a dry skin treatment. I learned that this lotion isn't greasy, and it dries quickly. I subscribe to the SkinMD newsletter. -I learned that their shielding lotion becomes part of the skin's protective barrier helping to strengthen and restore it. This ability allows Skin MD Natural to retain skin’s own natural oils alleviating the need for artificial moisturizers as a dry skin treatment.